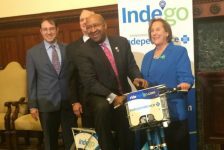 On November 4, the first weekday after the clocks were set back, the Bicycle Coalition of Greater Philadelphia (BCGP) quickly responded to the earlier darkening. On Broad Street at the corners of Spruce and Pine Streets, BCGP staff and volunteers gave away and installed 200+ sets of lights. Here are a few pictures Philly Pedals photographer Thom Carroll took while stopping by to get a set of lights for himself. 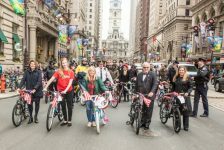 Thank you, Bicycle Coalition, for more than 40 years of work at making the Streets of Philadelphia a better place to ride – and for keeping our photographer and his gear safe at night!